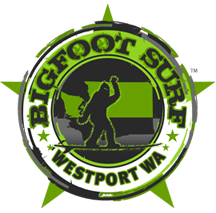 BigFoot Surf School, Westport WA, Learn to Surf! And ends with you forever stoked on surfing! To Your Goals & Ability Level! Westport Wa – The Place To Learn To Surf & Take Surf Lessons! Start your surfing adventure with surf lessons from BigFoot Surf School at Westhaven State Park. BigFoot Surf School is now offering private & semi-private surf lessons at Wesport’s Westhaven State Park. The only WA State Parks Permitted Surf School in all of WA. Westport is the place to learn-to-surf in Washington State! In addition Westport (WA’s Surf City) was recently voted by KING 5’s Evening Magazine’s Northwest Escapes as Washington’s Best Place To Surf! If you’re looking to check one off your bucket list, or a family itching for a new adventure; BigFoot Surf School is for you. We strive to ensure a lesson experience that respects the local community and develops you into becoming a safe and successful surfer for just the day – or for life! We Love To Teach Surfing! BigFoot Surf School is dedicated to providing YOU the most comprehensive surf lessons experience in the Pacific Northwest! We have a combined 40-year experience in surfing Westport and coaching beginner, intermediate & advanced level surfers. We offer the most incredible surf lesson/experience around! Private and Semi-Private Lessons available Wed, Fri, Sat, and Sun. We specialize in all levels of surf coaching from beginners to advanced. Fully insured with confirmed government background checks on all coaches. The only WA State Parks Permitted Surf School in all of WA since 2014. Red Cross Certified First Responders – First Aid, CPR & AED. Give us a call for more information or if you have any questions 360-515-7969. We’d love to say Mahalo! We Love Sharing The Surfing Stoke, See What Our Students Are Saying! We love to teach surfing! Yep, we certainly do! , and are dedicated to providing a fun and safe surf lesson experience. We strive to please our customers Westport WA., The Place To Learn To Surf! The first time I went surfing with BigFoot I wasn’t sure what to expect. My whole life I have been skiing but surfing was new and exciting. I was definitely nervous standing on the beach looking at the waves, but the sand clinic alone made me feel confident. As a ski instructor myself I noticed BigFoot’s teaching model and progression is based on an internationally recognized certification (PSIA). By the end of the 90 minute lesson I could paddle into a wave, stand up, and even turn. The coach gave me the skills I needed to feel safe in the water. I am now hooked on surfing and continue to get lessons from BigFoot. The BigFoot Surf coaches are amazing. I was fortunate to meet them early…I had just turned 40 and knew that I wanted to try new things, things I’d always been too afraid to do before then. A lifelong fear of having water in my face did not deter these guys. Giving you just enough information to take the next step, encouraging you as you go, and continuing to push you just far enough outside your comfort zone is what they do. After spending a summer of receiving their coaching I was able to try out my new skills in the Hawaiian waters and keep up with the others in the water. No one thought I was a kook, well I wasn’t afterall, I had been coached by the best…BigFoot Surf School! The guys at BigFoot Surf School really got me on track. I had been surfing a few times but rarely stayed on my feet for any amount of time. I didn’t feel like a Surfer until after my lesson with BigFoot. The first thing I learned is that a bigger board is a more stable platform for beginners. Then we got to the water and BigFoot was fixing my movements that would throw me off balance in the past. After every time I caught a wave the coach would have another tip for me. Then all of a sudden I was Surfing, every wave was a long ride and it was coming naturally. There was a transformation of my surfing in one day. Thanks! We are a team of coaches who have been surfing all over the world and honing our coaching skills at Westport for over a decade. We are trained and certified in child and adult learning methodologies to ensure the success of our students at any age. We hope you’ll take the opportunity to spend time in the water with us – we know you’ll enjoy your experience. Learn More. BigFoot Surf School Now offering - 2 hour private and semi-private lessons every weekend this summer! Call for reservations or book online. Also offering special needs, corporate or private party inquiries. Contact us today - 360-515-7969.